Loads of exposed wood & the Fullers was on top form. Not a really big pub, but cavernous compared with the Britannia Tap. The curry special looked to be good value. This 'local' is extremely well maintained..offers a full selection of well kept Fullers beers including a seasonal ,...currently their new refreshing Front Row ale. They have two wood burners and interesting brewery related eclectic bits and bobs everywhere and the bar surface is always shiny and well polished... always a good sign! The staff are always consistently efficient and welcoming. They have good product knowledge and are happy to guide you through the Fullers range. This brewery takes training seriously and it shows. I regularly drop in for the Sunday Roast carvery where there is a choice of two meats, with fresh vegetables and all the trimmings, the Exmoor beef today was as delicious as always. The Warwick is a well kept secret and is very different from other somewhat impersonal and more commercial pubs in the area. Well, I only get to the Warwick Arms on my occasional visits back to the UK so - as an indication of how highly I rate this pub - when I had 48 hours in London last week I spent a few of them there. I walked in the door and was presented with my pint of London Pride even before I'm made my way past the greetings to the bar. They don't make a big fuss of my occasional visits from the other side of the World. Just a brief "Good to see you. How long are you here for?" and then just join in the conversation like you've never been away. The London Pride - beautiful, cool not cold, clear and well presented. 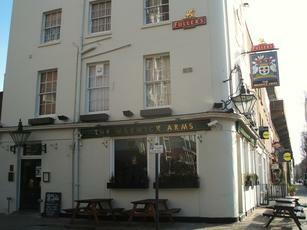 Australian beer is perfect for Australia - London Pride is perfect for London - The Warwick Arms is the perfect local. Good range of Fullers beers with a decent �3.25 Pride. Had a nice pub curry which was a cut above your normal pub curry in terms of taste & presentation. Quite a long narrow pub so a bit of a squeeze as our table was about 3 foot from the bar!